Twitter is looking to place its promoted tweets right in front of users' eyeballs in an attempt to boost its advertising business . 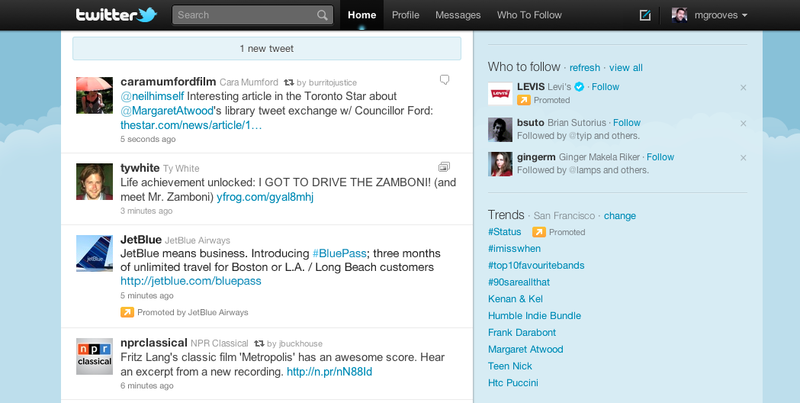 This isn't Twitter 's first go-round with promoted tweets. In the spring of 2010, the privately held microblogging site first introduced the feature, which lets advertisers pay for sponsored tweets that appear at the top of search results for certain keywords. However, on Thursday, Twitter announced in a blog post that sponsored tweets from companies that users follow will go straight to their timeline. And instead of the promoted tweets moving down the timeline like all other tweets, these will stay at or near the time of the user's timeline until the user logs in to check tweets. Twitter will be trying out the new feature in the next few weeks with a small group of companies, including Best Western, Dell , Groupon, HBO and JetBlue. "From the start, our philosophy around advertising has been simple: We put our users first and strive to create products that enrich the Twitter experience for every Twitter user," Twitter noted in a post. "We're excited about this next step and look forward to your feedback." Ezra Gottheil, an analyst with Technology Business Research, said Twitter is on a good track in terms of building up ad revenue. "It's a chicken soup thing. It can't hurt," said Gottheil. "One way or the other, they have to prove that this increases awareness or click-through. If they do that, sponsors will pay for it. Keeping the tweets at the top of the timeline will certainly increase the likelihood of users seeing the tweets." It also helps that the promoted tweets are going directly to users who follow the companies paying to have their tweets highlighted. "And if they're following the advertiser in the first place, then the user wants to see them," he added. "I can see this working for sales and events." The fact that Twitter is working on revenue generating plans has to come as good news to industry and financial analysts who long complained that the company was running without a business plan. Gottheil said it's good to see Twitter getting on the business track. "Twitter provides a real service and I'd like to see them stay around, but I don't think they're going to get the users to pay directly," he noted. "But if you have the eyeballs, you should be able to find a way to make it pay."